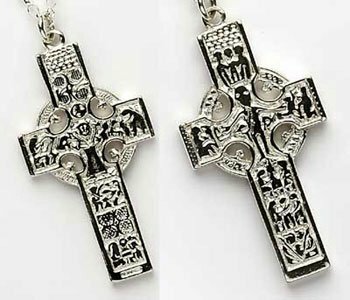 Beautiful Celtic Cross Pendant handmade in sterling silver or gold faithfully captures all authentic detail of the original Celtic cross found at the monastery of Durrow. 39mm high and 19mm wide. 7g silver weight. 8.2g gold weight. With 18 inch chain. which, from the great numbers of oaks is … called dermach, the field of oaks". by St. Columba – also known as St Columcille. 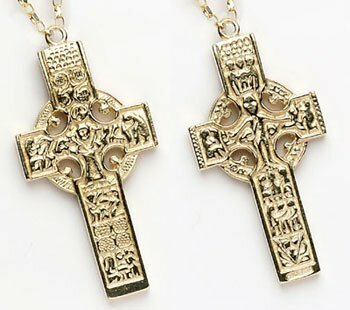 as the Cross of Durrow. the Trinity, or the Holy Family? It may indeed be both. each Gospel and a full page symbol of each of the Four Evangelists. "With its books and learning A devout city with a hundred crosses".